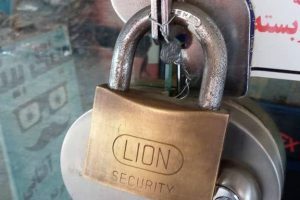 HRANA News Agency – The premises of six Baha’i business owners in Khorramshahr, which were sealed on 15 November, remain sealed after two weeks. 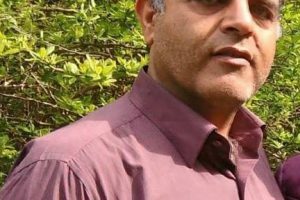 A source close to these citizens told the HRANA reporter: “Of the sealed businesses in Khorramshahr, five were owned by six families. Four of them are Baha’i families living in Abadan and two are Baha’i families living in Khorramshahr. After repeated follow up by these citizens with the Office of Public Places, the Labor Unions, the Ministry of Intelligence Office, the Public Prosecutor’s Office and other responsible institutions, the Office of Public Places told them: “You do not have a right to work or do business”. 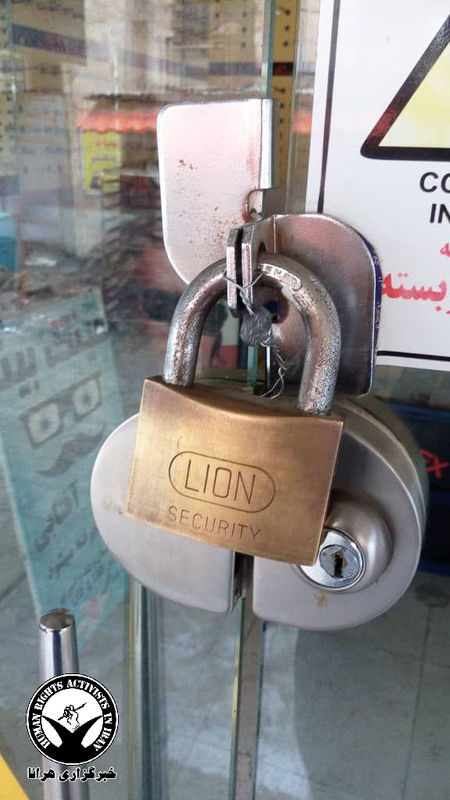 The businesses of these six Baha’is have been sealed since 15 November, as ordered by judicial institutions and implemented by the Office of Public Places of Khorramshahr. The names of these six Baha’is obtained by HRANA, are Behrouz Habibi, Hosaynali Habibi, Behnam Habibi, Bahador Ahmadi (all four own optician’s shops), Kambiz Azadi (owner of a sewing machine store) and Kourosh Jaberi (owner of an engine repair business). Moreover, in the same province the businesses of five Baha’is from Ahvaz, Vargha Derakhshan, Behrouz Zohdi, Jahanbakhsh Afsharzadeh (all owners of interior decoration businesses) and Fayzollah Ghanavatian (television repairman) were sealed on 12 November by order of the judiciary; they were eventually unsealed after 15 days on 27 November. 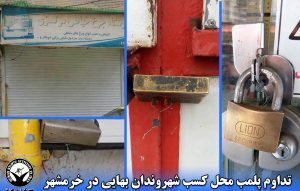 Prior to this, HRANA had also reported about the November 5th sealing of the businesses of two Baha’is in Abadan, Aram Azadi and Arman Azadi, as ordered by judiciary officials in connection with recent Baha’i holidays. On November 19th of the current year, this news agency published a detailed report about pressure on the Baha’i community and the arrests of followers of this religion. Based on this report, Baha’is in several cities in the country have been facing a new wave of pressure and obvious violations of human rights from the beginning of this year until the date the report was compiled. Prevention of at least 58 Baha’i students from continuing their education after they took the national university entrance examination, expulsion of at least 11 Baha’i students at different levels of university education, banning from economic activities and dismissal of at least 6 Baha’is from private business premises or private companies, the summons and arrest of 72 Baha’is by security agents, sentencing of 24 Baha’is to a total of 46 years of imprisonment and 9 years of exile, widespread publishing of so-called cultural and media anti-Baha’i productions, continued closure and sealing of businesses of many Baha’is, desecration of graves and preventing the burial of Baha’is in Baha’i cemeteries in various cities are all merely part of the increased pressure on these citizens of this country from the beginning of the year to the date this report was published. Based on their religious beliefs, Baha’i citizens close their businesses for the purpose of observing their religious holidays. However, despite clear legal and civil rights of individuals to observe their religious beliefs as well as manage their business premises, the police and security forces close their places of work. The sealing of the Baha’i-owned businesses is done in situations when according to section B of Article 28 of the Law of Trade Union, owners are allowed to close their businesses up to a maximum of 15 days without informing the Union. Posted in Closure of Business, Khorramshahr, Khorramshar.